2013 marks the 20th Anniversary of Steven Spielberg's Oscar winning film Schindler's List, and Universal is acknowledging the milestone by giving the film a Blu-ray release with a 20th Anniversary Limited Edition. Set to arrive in March, the Blu-ray Combo Pack will include the film on Blu-ray and DVD as well a digital copy and UltraViolet. 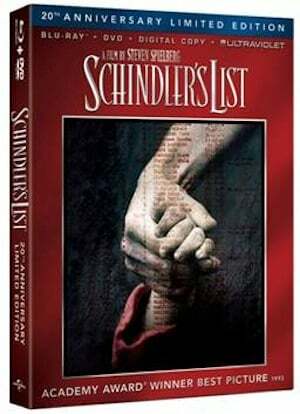 Directed by Spielberg, the 1993 black-and-white drama is based on Thomas Keneally's novel Schindler's Ark and stars Liam Neeson as the title character Oskar Schindler, a Catholic man and member of the Nazi party who puts his life and career on the line by employing 1,100 Jews in his factory during the Holocaust. Also among the cast are Ben Kingsley, playing Schindler's accountant, and Ralph Fiennes, who played a cruel Nazi commander. For its Blu-ray release, the film has been "meticulously restored from the original film negative in pristine high definition, supervised by Steven Spielberg." Bonus features include "Voices from the List," a documentary that includes testimonies from Holocaust survivors. And also "USC ShoahFoundation Story with Steven Spielberg," which focuses on how Spielberg was inspired by the film to start the USC Shoah Foundation, an institute for visual history and education. It's hard to believe the film is turning twenty this year. Given the anniversary, the timing seems right for the movie to make its Blu-ray debut, and for the film to get touched up for high def. It's certainly one of the more moving historical pictures in movie history and well worth owning. Universal has the release date for Schindler's List 20th Anniversary Limited Edition set for March 5, 2013. Below is a look at the box art for the set.